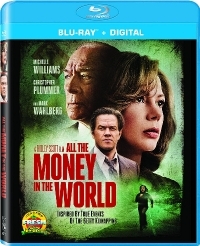 From the master, Sir Ridley Scott, All the Money in the World follows the kidnapping of 16-year-old John Paul Getty III and the desperate attempt by his devoted mother, Gail (Michelle Williams), to convince his billionaire grandfather (Christopher Plummer) to pay the ransom. The film is inspired by historical events. After a member of her tribe sets fire to an American soldiers' camp during the War of 1812, a young female Mohawk finds herself pursued by a ruthless band of renegades bent on revenge. Available for the first time on 4K Ultra HD Combo Pack comes Alex Proyas' film about a college professor who discovers in a time capsule a series of numbers that predict coming disasters. Jeff (Disney Channel’s Ross Lynch) is an awkward teenager struggling to make it through high school with a family life in ruins. His bizarre behavior at school attracts unexpected friends, a group of band-nerds who form The Dahmer Fan Club, headed by Derf Backderf (Alex Wolff, “Patriots Day”). But as they near graduation, Jeff’s depravity continues to take hold, and he spirals further out of control. Based on Backderf’s critically acclaimed 2012 graphic novel, and written for the screen and directed by Marc Meyers, MY FRIEND DAHMER is the haunting, sad, funny, true story of Jeffrey Dahmer in high school. Set in the glamour of the 1950's post-war London, renowned dressmaker Reynolds Woodcock (Daniel Day-Lewis) and his sister Cyril (Lesley Manville) are at the center of the British fashion, dressing royalty, movie stars, heiresses, socialites, debutants and dames with the distinct style of The House of Woodcock. Phantom Thread is a Gothic Romance of twists, turns and power struggles. oops, I posted accidentally, let me try again. I love these "New on..." posts, but they could be organized better. Could you maybe have a text link with the name of the movie to break up the selections? That would help because the pics are broken on my end and it's confusing. Keep up the great work! Hey! Thanks for letting us know. Can I ask if they've always been like that or has it been recent. Also, what browser do you use? Thanks! Amazon links are broken for me, too.